Hurricane Harvey strengthened to a Category 1 hurricane Thursday afternoon and is currently forecast to make landfall over southeast Texas later today or early Saturday. The National Oceanic and Atmospheric Administration (NOAA) expects Hurricane Harvey to continue to strengthen, becoming a Category 3 hurricane before making landfall, and stall over the state, bringing heavy rainfall, winds, and a significant storm surge to the area. To help analysts assess energy-related potential storm effects, EIA maintains an energy disruptions map that displays energy infrastructure and real-time storm information. If NOAA’s current expectations are realized, Hurricane Harvey will be the first major hurricane—those rated Category 3 or higher—to make landfall in the United States since four major hurricanes (Dennis, Katrina, Rita, and Wilma) made landfall in 2005. Because of the slow speed of the storm and the forecast for it to stall over Texas, NOAA expects prolonged periods of torrential rainfall, leading to the potential for severe flooding in the region. On Wednesday, the governor of Texas declared a state of disaster for 30 counties in the path of the storm. 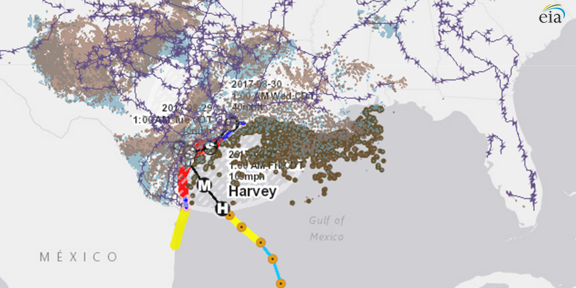 Flooding and high winds caused by Hurricane Harvey have the potential to affect energy infrastructure in the region, including the Texas Gulf Coast, the home to a great deal of oil and natural gas infrastructure. The U.S. Gulf of Mexico accounts for nearly 20% of total U.S. crude oil production, and the Texas Gulf Coast is home to nearly one-third of U.S. refining capacity. As of Thursday, August 24, several oil companies had already shut in production from several facilities and had evacuated personnel from offshore platforms. Hurricanes Gustav and Ike in 2008 and Hurricane Isaac in 2012 were the most recent hurricanes to make landfall on the U.S. Gulf Coast, with Ike being the last hurricane to directly affect Texas. All three storms affected oil and natural gas infrastructure in the region, each shutting in more than one million barrels per day of crude oil production and more than three billion cubic feet per day of natural gas production and temporarily shutting down significant pipeline and refining capacity. About half of U.S. oil production has historically come from Texas and the Gulf of Mexico. Texas also accounts for about a quarter of U.S. natural gas production. EIA’s energy disruptions map displays key layers of energy infrastructure—including oil refineries, power plants, and major electric transmission lines—and real-time storm information from the National Weather Service. The web page also contains links to the U.S. Department of Energy’s Emergency Situation Reports and other websites that provide updates on the effect of severe weather on energy infrastructure. In addition, EIA's U.S. Electric System Operating Data tool provides near real-time information on electricity demand and can show areas where electricity service has been disrupted.